JAPAN’S lower house voted yesterday to pass the consumption tax increase and social welfare-related legislation. The implications of that move are as I described in a post last weekend. The basic facts are available everywhere, but other aspects are worth noting. *57 members of the ruling Democratic Party voted against their government’s bill, and 16 abstained. That’s serious business; 54 is the margin at which the DPJ loses its lower house majority. The Sankei said the total jolted Prime Minister Noda, because he had been working to limit the defections and thought there would be only about 30. The possibilities of a no-confidence vote and a DPJ split are real. * Despite days of speculation that he would form a new party, rebel chieftain Ozawa Ichiro says he is staying put for now. He asked his allies to leave the handling of the situation up to him. Those with a taste for watching power struggles will appreciate his cleverness. First, he insists that his vote represents the original will of the party as expressed in the 2009 election manifesto. Second, by standing pat, he forces Mr. Noda into taking the destructive step. The prime minister said he would be “strict” with those who didn’t follow the party line, which could include suspension of party privileges or even expulsion. But that’s too many people to expel and survive. The internal opposition lives. Complicating matters is that Liberal Democratic Party head Tanigaki Sadakazu is demanding that Mr. Noda do something with Ozawa and the rebels. In fact, he said the LDP’s condition for cooperation to pass the bill in the upper house is that he “deal firmly” with those who failed to vote the party line. Yes, he is making the internal affairs of another party his business. Was part of the three-party deal to pass the tax bill an unspoken agreement to strike down Mr. Ozawa? In short, Mr. Noda is damned if he does and damned if he doesn’t. He has one potential weapon, however: Even though Mr. Ozawa was found not guilty of violating the political funds law earlier this year, that was a function of the legal process. It was not necessarily in accord with the actual facts of the matter. The LDP has demanded that he be questioned in the Diet about the circumstances of all that money. The prime minister might now allow that to happen. * After the vote, DPJ Secretary-General Koshi’ishi Azuma said, “The DPJ will absolutely not fall apart.” The man’s wishin’ and hopin’. Maintaining the DPJ as a semi-functional unit has been his priority throughout the whole sequence of events. He represents the nether left of the party, and a viable DPJ is their only means to so much as sniff a position of power or influence in government. That disappears with a DPJ breakup, and many of the rank file would then have a hard time getting reelected, much less listened to. * Former Prime Minister and DPJ Supreme Advisor Hatoyama Yukio voted against the bill and resigned his position of Supreme Advisor. Still among the party’s Supreme Advisor ranks is Watanabe Kozo. Recall that Mr. Watanabe cordially asked both Mr. Ozawa and Mr. Hatoyama to vote against the bill and leave the party for good. Yesterday the Sankei Shimbun published one of those “all you have to do is look” photographs. It showed a smiling Ozawa Ichiro walking back to his seat in the chamber after casting his vote. He was enjoying a pleasant chat with another smiling Diet member. The other man was Watanabe Kozo. That tells you all you need to know about the National Political Establishment (NPE). Prof. Ikeda concluded that Mr. Ozawa was not so interested in the votes of the younger demographic. * Meanwhile, during his 6:00 p.m. news conference, Mr. Noda stressed the importance of the bill for maintaining the social security system. He does not seem to have considered the idea of overhauling the system to add serious reforms to keep it both viable and affordable, nor has he given much thought to serious reforms of government to reduce expenditures. In other words, he is ignoring the global collapse of the social welfare system as we know it. “The (three-party) agreement that reflected the LPD position in its entirety, and the passage of the bill in the lower house, represent a major advance that has achieved “the politics of decisiveness”. Give him credit: That combines self-congratulation for getting the DPJ to swallow the LDP requests, congratulating the DPJ for passing the bill, criticizing the DPJ for having problems passing the bill, and calling for the prime minister to dissolve the lower house and call for a general election. Not everyone can concentrate the universe of power politics brutality into a few short sentences. And despite their deal with the DPJ, the LDP could still introduce a no-confidence motion. * Ozawa Ichiro said yesterday that he thought it wouldn’t be long now before a lower house election was held. Commentator Takahashi Yoichi suspects that the two major parties will replace both Mr. Noda and Mr. Tanigaki as their leaders for an election in the early fall. And hasn’t all that led to this? …I left the Liberal-Democratic Party because I thought a two (major) party system would stabilize politics. The Democratic Party has worked really hard, but things didn’t work out as I thought they would. No one is saying they have hopes for the LDP because the DPJ is terrible…and no one is saying they want to back Ozawa Ichiro because they can’t rely on Prime Minister Noda Yoshihiko. – Watanabe Kozo (79), one of six “supreme advisors” of the Democratic Party of Japan. The statement is all the more astonishing because it combines clear insight (the last part that begins with “No one”) with such balderdash that it is manifest he hasn’t been paying attention to the events transpiring under his nose or the popular will for the past 20 years. IF Prime Minister Noda Yoshihiko hadn’t realized there were risks in appointing people who required training wheels to the most important Cabinet positions, he knows it now. It took less than a fortnight for former METI chief Hachiro Yoshio to slip on two banana peels and take a pratfall into the airshaft, quickly casting a pall over any inicipient Era of Good Feelings that bubbled up with the departure of Kan “The Millstone” Naoto. With our 411 Diet members, unity of strength results from unity of spirit. Properly recognizing the weighty decision of former Minister Hachiro, we will fully enforce information management, including our response to the mass media. It’s not surprising that Mr. Koshi’ishi is openly talking about “information management” as a mechanism for interacting with the news media. He’s a card-carrying member of the left flank of the party’s left wing, and was an official of the Japanese Teacher’s Union when the union president was an open sycophant of North Korea’s Kim Family Dynasty. The shift to managing the news required only a short hop. The skip and the jump weren’t necessary. So instead of an Iron Curtain, the DPJ’s Red secretary-general is going to bring down the Koshi’ishi Curtain after Mr. Hachiro, an ex-Socialist, talked himself out of a job in nine days, and after Matsumoto Ryu, an ex-Socialist, talked himself out the Reconstruction Minister’s job in even less time earlier this summer. And who can forget Yanagida Minoru, an ex-Democratic Socialist, who talked himself out of the Justice Minister’s job last fall after all of two months? He resigned after saying that his job was a snap because all he had to do was repeat two meaningless stock phrases to stiffarm any questions. Let’s go out on a limb and say a pattern is starting to emerge. Meanwhile, all seven opposition parties are livid that the DPJ government decided to convene an extraordinary Diet session for a mere four days. (That includes New Komeito, which Mr. Noda has been trying to sweet talk into a coalition.) The Liberal-Democrats asked them to extend the session to late October, but the government did not deign to reply. The party’s Diet management resulted in some unpleasantness during Mr. Noda’s first address to the chamber as prime minister yesterday. Some heckling goes on during the speech regardless of the party in power, but a few LDP members amped up the level so drastically, it was as if they were trying to shout the man down. So, just two weeks after being shed of Kan Naoto, the Noda Cabinet has royally cheesed off the news media and the opposition parties. That sound you hear is battleaxes being sharpened on whetstones. Didn’t get off on the good foot, now did they? For reference, this is what the Good Foot looks like. – Oshima Tadamori, vice-president of the Liberal-Democratic Party. – Abiru Rui, Kantei correspondent for the Sankei Shimbun. Mr. Ichikawa has a degree in agricultural civil engineering, and once served in the Agriculture Ministry. He is also a member of Ozawa Ichiro’s faction. Azumi Jun as Finance Minister. Mr. Azumi was an NHK announcer before becoming a politician and has no discernible qualifications for this post. In fact, he has never been a full Cabinet minister before, yet was given one of the three most important portfolios. He is, however, a dependable partisan attack dog. The Nikkei share price index fell 146 points shortly after his appointment was announced. Gemba Koichiro as Foreign Minister. Mr. Gemba has been a professional politician since the age of 26 and has no discernible qualifications for this post, either. He is in favor of reinterpreting the Constitution to allow for collective self-defense. He opposed the efforts of Kan Naoto and Sengoku Yoshito to reopen discussions of reparations payments to South Korea by reminding them that the issue had been resolved by the 1965 treaty between the two countries when Japan paid the South Korean government the equivalent of $US 800 million. Hachiro Yoshio as Minister of Economy, Trade, and Industry. Mr. Hachiro also has a degree in agriculture and is a veteran of the Socialist Party, which speaks eloquently to his qualifications for his new job. He is also a member of a Diet group (mostly from the DPJ), who urge friendly ties with North Korea and think the problems with that country’s nuclear missile program can be resolved by closer ties with South Korea. Mr. Hachiro is opposed to participating in the discussions for the Trans-Pacific Partnership (TPP), a regional trade agreement, which Mr. Noda supports. 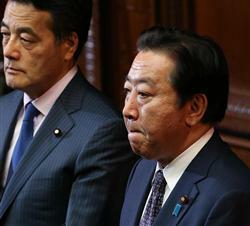 The prime minister retained in his Cabinet another prominent TPP opponent, Agriculture Minister Kano Michihiko. READER Marellus recently asked if I would handicap the field for the Democratic Party election to replace Kan Naoto as president, and therefore prime minister. I demurred, because (1) I avoid predictions as a rule (the rule being that predictions are usually journalistic space filler), (2) Most predictions are wrong, (3) Most people can’t get the past or the present right, especially about Japan, and (4) Even veteran Japanese politicians and pundits hesitate to make such predictions. Q: It seems that Finance Minister Noda is the favorite in the DPJ presidential election. W: Now Kano (Michihiko, Agriculture Minister) has gotten the upper hand. W: It’s extremely regrettable, but Noda is the Finance Minister, so he can no longer oppose a tax increase….With the aging of society, we need to create funding sources for social welfare. There’s also the reconstruction of the Tohoku area after the earthquake and the nuclear accident. It’s common sense that there has to be a tax increase. Embarrassingly enough, many Diet members in the party are opposed to a tax increase (thinking of the election). The Finance Minister is not in an advantageous position. Q: It seems as if Mr. Noda is toning down his remarks, saying that he would think about the timing of a tax increase. W: We don’t know yet. It’s not a question of whether a person is unacceptable or acceptable. At first, the atmosphere was such that there was little opposition to Mr. Noda, but that has dissipated. It might be because they are irresponsible, but politicians are a jealous lot. The people who have served more terms than Noda aren’t interesting. But the older veteran MPs have started to support Kano. Q: What is former party President Ozawa Ichiro up to? W: Ozawa has about 50-70 votes. He still hasn’t made up his mind. Kaieda, who quarreled with Prime Minister Kan, is actively trying to curry favor with Ozawa and run in the election. Q: Former Foreign Minister Maehara hasn’t made a definitive statement. W: He is the most popular among the people. He’d win if there was a direct national election, but he’s still unsure because of problems with financial donations and other issues…Maehara and Noda won’t run against each other. Just one of them will run. Q: Maehara has a cautious approach to a tax increase and a forward looking approach to ending deflation….In policy terms, he seems to be closer to Mr. Ozawa than Mr. Noda. W: That doesn’t make any difference. Ozawa isn’t motivated by policy. He’s always looking to protect his authority and grow stronger. He can’t be bothered with people who won’t serve as his retainers. I’m the only person who can get along with him without becoming his retainer, and that’s why the mass media comes to me….Maehara has a philosophy and he’s not the simple sort that will become a retainer. Kano won’t either. He’s sober and subdued, but a fine man. He isn’t motivated merely by personal interest. 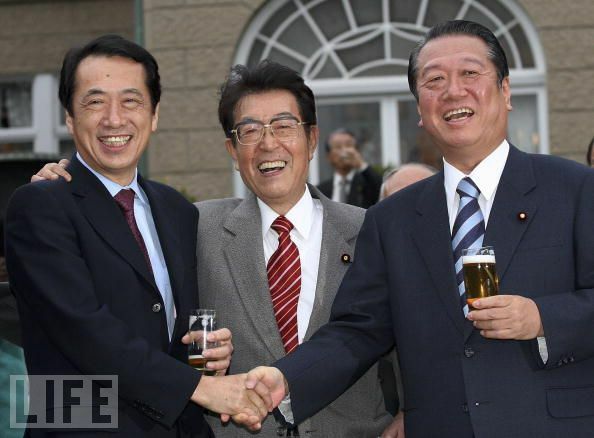 L-R: Kan Naoto, Watanabe Kozo, and Ozawa Ichiro pretending that they like each other. Note the amount of liquid remaining in Mr. Kan's glass and the expression on his face. Q: From the people’s perspective, Mr. Kano is the exact opposite of Mr. Maehara. He’s understated, older, and people don’t understand his policies. I wonder if the party will select a person like that. W: It’s not the party. Politics is a world of jealousy. He’s less conspicuous than Noda or Maehara, he’s older, and he’s served more than 10 terms, so people won’t get jealous. Q: Noda and Maehara say a grand coalition is necessary. W: That’s a misunderstanding. The mass media uses the term grand coalition, but in that sort of arrangement, both parties provide an equal number of ministers and deputy ministers to the Cabinet. What they’re talking about now is cooperation on common areas of policy…There are more than 100 LDP members who lost the last election and who think that a dissolution of the Diet can’t come a moment too soon. A grand coalition won’t emerge from the discussions of party leadership alone. Q: Will whoever wins the DPJ election stay in office until September 2012? W: The lower house term has two years left, but the party members will officially take part in an election in September 2012. The idea that’s gained strength is to give the job to Kano, elect a popular politician in September 2012, have them serve a year, and then dissolve the Diet. Q: Japan will face many problems in the next year. Isn’t it impossible to obtain the cooperation of the LDP, which is seeking a Diet dissolution, without a coalition? W: Everyone agreed on the second supplementary budget for reconstruction, including the Communist Party. Since then, the LDP has also agreed on Diet legislation for dealing with the destruction. But behavior unrelated to partisan interests is limited to those recovery measures. There will probably be no cooperation for reforming taxes or unifying them with social welfare. Q: Will conditions for the DPJ election remain fluid? W: We won’t know until the very end. At this point today, even I don’t know who it will be. But to boil it down, the main candidates are Kano, Noda, and Maehara. W: I don’t know….it could turn out to be a two-man race between Kano and Noda or Maehara. Q: Will there be a political reorganization after the next election? W: They say the split is anti-Ozawa and pro-Ozawa, but Ozawa doesn’t have any power now. That’s why I don’t think there’ll be a reorganization. Q: Will the next DPJ president’s administration be a short one? W: Another election will be held in the fall of 2012. If he (the party president) implements good policies, he could win reelection and continue. * Since that interview, Maehara Seiji has moved closer to declaring his candidacy. It was reported elsewhere last week that his group/faction within the party was pushing him to run because he is “popular”, and he could therefore dissolve the Diet and win a general election. That wish-upon-a-star faith in Mr. Maehara’s popularity is an excellent illustration of the vapidity of the generic DPJ pol. His popularity is entirely superficial at this point, akin to picking out the best-looking guy from among a group of PR photos scattered on a table. His performance as party president when the DPJ was in the opposition and in two Cabinet posts suggests that he lacks the gravitas for the two roles he must fulfill: one as national leader and the other as leader of a party that is in a philosophical shambles. (Maehara/Edano group member Sengoku Yoshito will try to hold it together for him, but that was beyond Mr. Sengoku’s abilities for the Kan Cabinet.) His public support could evaporate just as quickly as that of Hatoyama Yukio and Kan Naoto. * The Western media will describe Mr. Maehara as a “defense hawk”, which he is — in regard to China. In regard to North Korea, his hawkdom quotient is roughly at Jimmy Carter levels. His past dealings with that country might come back to bite him. The nature of those dealings is still unclear, but the opposition is sure to make the effort to clear things up. * Another excellent example of DPJ party members living in a room full of mirrors is the idea that they could go with the boring Mr. Kano for a year, replace him with someone “popular”, and then win an election. Really, are these people still in short pants? Sensible policies clearly explained and forthrightly implemented by people who act confidently win elections. * Mr. Kano was also the agriculture minister in an LDP Cabinet when he was a member of that party, long ago and far away. He is widely considered to be in the pocket of the Agriculture Ministry (a zokugiin, for those familiar with the Japanese term). He is opposed to joining discussions for the TPP, which was one of Kan Naoto’s flavor-of-the-month initiatives. Despite knowing of that opposition, Mr. Kan retained him in a Cabinet reshuffle that occurred after he made the TPP proposal. The DPJ a reform party? Ha ha ha ha ha! * A veteran Japanese journalist wrote an opinion piece last week speculating that Ozawa Ichiro might support Sengoku Yoshito (based on vague remarks made by Mr. Ozawa at a fund-raising party). * Yet again, a politician says that he thinks a tax increase is “common sense”. In the real world, common sense would demand that politicians CUT SPENDING before raising taxes, but we’re as likely to find a politician with common sense living in the real world as was Diogenes to illuminate an honest man with his lantern in broad daylight. The members of Your Party certainly have a flair for analogy. Describing the prospective field of candidates for the DPJ election, Secretary-General Eda Kenji compared them to a mop-up pitcher in baseball sent in to eat innings and finish up the game after his team no longer had a realistic chance of winning. A double election in Japan? Newspapers have come upon a bend in the road. As the bureaucratic structures of Kasumigaseki have hypertrophied, I wonder whether newspapers are now dependent on the bureaucracy for too much of its information. I wonder whether the reporters’ club system, which has existed as a mechanism for monitoring government offices and authority, has now become a tool through which the bureaucracy has domesticated reporters. I’ve been a reporter for a long time, but I cannot restrain these thoughts, which have been growing over the past few years…Newspapers have been working as a cheering section for Kasumigaseki. It’s natural (in these circumstances) to hold an election. A double election is highly possible. By that he is referring to dissolving the lower house of the Diet before the end of its term to hold an election on the same day as the upper house election in July. Elections in that chamber are held regularly every three years, with half of the seats at stake. This Diet could be dissolved when its term ends in June for a double election the following month. Mr. Ishiba suggested that his party find a way to form an electoral alliance with the new Tachiagare Nippon (Arise Japan) Party recently created by Hiranuma Takeo and Yosano Kaoru, both former LDP members, rather than criticize them as backstabbers. During last year’s election campaign, Yosano Kaoru dismissed Hatoyama Yukio’s promise to maintain the consumption tax rate for another four years as a “fairy tale”. He praised Okada Katsuya, Mr. Hatoyama’s opponent in the election for the DPJ party presidency, for being more realistic about the need for a tax increase. 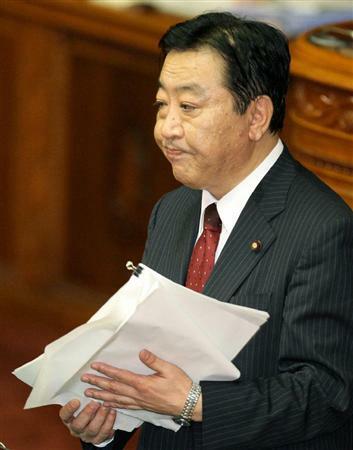 That accelerated when Yosano Kaoru held three different ministerial portfolios for economic and financial affairs from 2008 to 2009, into the government of Aso Taro. The Finance Ministry is the most powerful of the government ministries, and the one most likely to interfere with the political process. Though Mr. Yosano was not affiliated with that ministry or an MP working on their behalf in the early part of his career, he is now viewed as such. As the head of an LDP group examining fiscal reform in 2007, he opposed proposals to dip into the so-called “Kasumigaseki buried treasure” of special account surpluses and other reserves, estimated at JPY 15 trillion (about $US 160.6 billion). Bureaucrats heart big government. The Finance Ministry also wants sound finances. That means they want higher taxes to pay for their main squeeze, rather than a government downsizing by reformers who want lower taxes, privatization, and less bureaucratic meddling. Mr. Yosano and Ozawa Ichiro are friends. They play go together. Mr. Ozawa has long been rumored to be interested in splitting up the DPJ, taking the non-leftist elements loyal to him, and creating a new political force. He surely knows the electorate views him as kryptonite. Mr. Yosano ran for LDP party head against Aso Taro two years ago, and would have become prime minister had he won. In addition to go, one of Mr. Ozawa’s hobbies is cobbling together coalition governments with small, incompatible parties. Sock puppet Finance Minister Kan Naoto has brought up the possibility of raising the consumption tax in recent days. He thinks convincing the public of the need for a tax increase is “doable”. National Strategy and Reform Minister Sengoku Yoshito also alluded this week to the need to boost the consumption tax. But everyone knows a tax increase wasn’t in the DPJ’s election platform, so a significant tax hike would require a referendum. In a parliamentary form of government, that means a lower house election. Journalist/commentator Itagaki Eiken, who writes as if he has sources in the DPJ, thinks Ozawa Ichiro might be planning a double election as a way to destroy the LDP and to “purify” the DPJ of their money politics problem. He notes that LDP Secretary-General Oshima Tadamori referred to the possibility of a double election at a meeting of senior party leaders on Monday. Mr. Oshima stressed the need for the party to move quickly to round up potential candidates. Mr. Itagaki admits it might be an Ozawa bluff to clamp down on anti-Ozawa elements within the party, but he also says the Ozawa clique has been circulating and talking up the need to “smack the dog that’s fallen in the ditch” (the LDP). He thinks the Futenma base issue will be the excuse used to call an election. The results of that election would facilitate a political realignment and the establishment of a new “grand coalition” government. (The Hatoyama government) is seven months old. Rather than recall that something great was achieved, I only think it would have been better had it not happened. It now faces a political crisis…and (its) survival is now in question. (With him) it’s always elections, elections. Policy must not be formulated based on the standards of judging whether they will be an advantage or disadvantage in elections. Watanabe Yoshimi, the head of Your Party, lambasted the new government in an interview appearing in the 15 April issue of the weekly Shukan Bunshun and challenged Mr. Hatoyama to call a double election. Some segments have popped up on TV discussion programs like dandelions after a rain warning that Japan’s stratospheric debt levels could turn the country into another Greece. The programs follow the same pattern. They describe the disarray in Greece and the controversies over an EU bailout, and then reassure the public that everything is fine—today—because the nation’s aggregate savings are sufficient to pay off the debt. The bad news follows the first commercial break. Mounting debt levels will soon surpass the total aggregate savings, so “the country” has to start thinking of what steps need to be taken to get its fiscal house in order. Now take a look at that quote at the top of the post again. Japan has held two double elections since the end of the war. The first was called by Prime Minister Ohira Masayoshi and held on 22 June 1980, and the second was called by Prime Minister Nakasone Yasuhiro and held on 6 July 1986. Both resulted in substantial gains for the LDP, the ruling party at that time. In the first instance, however, the Ohira government had just been hit with a no-confidence motion that passed with some LDP votes. Ohira died before the election date, and it’s generally assumed that the ensuing LDP landslide was the result of a sympathy vote. One reason for a double election now would be to stick a fork in the LDP. It’s difficult to find candidates willing to run on short notice, and the LDP brand is no longer a popular one. Mr. Ozawa doesn’t think the DPJ would have a problem finding candidates, and he certainly knows the party has the money to run a double campaign. Does he underestimate the public disgust with the DPJ—or is he counting on that disgust to achieve his master plan of a political realignment? It’s worth noting that Watanabe Yoshimi’s attitude in this context is “Bring it on”. Your Party wouldn’t be able to contest many seats–their goal is 30 for the upper house election–but they don’t have to work hard to recruit candidates—the candidates are flocking to them, and the party is turning some people down. (Even, reportedly, a former Cabinet minister.) He’s also told those who want to run under the Your Party banner that they’re going to have to bear primary responsibility for their own campaign funding. Anyone who tries to predict the course of Japanese politics is a fool, and journalism that relies on speculation is a counterproductive waste of time to begin with. But Japanese politics does sometimes seem as if it has the qualities of the Buddhist state of emptiness, or the void, in which several possibilities exist simultaneously at a given point, any one of which might or might not manifest. Many factors are starting to converge. * Entropy is having its way with the LDP. * The DPJ quickly demonstrated that it is incapable of governing in its current form. The party was little more than a “We’re not the LDP” political congeries to begin with, so its long-term survival once it attained power was always questionable. * The hapless Hatoyama Yukio has been revealed as more helpless than even his immediate predecessors, and none of his potential successors within the party set the electorate’s soul on fire. * The public is impatient for reform. * The growing bureaucracy needs tax money to feed, and will always fight the efforts of small-government reformers such as Your Party. * The forces of those who favor smaller government, individual responsibility, and lower taxes are becoming established with the emergence of smaller agenda-driven parties based on those principles. * A double election might swamp the ability of those smaller agenda-driven parties to compete on a large scale, despite the public’s growing interest in them. * It might also hinder the ability to compete of the two junior coalition parties, the Social Democrats and the People’s New Party–not that many people would be very upset. * Those in financial circles overseas have been cranking the sirens about Japan ever since the DPJ government insisted on its irresponsible budget earlier this year. * The Finance Ministry seems to have launched its efforts as a political action committee in a campaign using free television advertising masquerading as infotainment to scare the public into jumping on board for higher taxes. Some think the stated reason for a double election would be Mr. Hatoyama’s handling of the Futenma base issue, and the use of the base as a metaphor for the Japan-U.S. security arrangement. While the prime minister’s base-related blundering is also a metaphor for his party’s incompetence in power, the real issues would be the big-government/small government debate and the necessity for a drastic political realignment. Whether or not the country is treated to the spectacle of a mid-summer double election jamboree, one thing is certain: Something new is starting to take form in the Buddhist void of Japanese politics.